Lipoblastoma is an uncommon, benign mesenchymal tumor with an excellent prognosis. It occurs primarily in infants and children, the majority of lipoblastoma occur in the extremities, with smaller numbers occurring in the chest, abdomen, head and neck. The omentum is a very unusual site, with only 7 prior reports in the English literature. ,,,,,, We report a case of giant omental lipoblastoma in a 13-month-old boy, which was treated successfully by total excision. A 13-month-old boy presented for a routine well-child check-up. On examination, an obvious mass was palpable in the upper abdomen. WBC, CRP, hemoglobin, PT/APTT, and α-fetoprotein were normal. Abdominal ultrasonography (US) identified a giant, echogenic, solid, multilobulated intraperitoneal mass that on computed tomography (CT) appeared as a well-encapsulated lobulated mass of fat-like density that filled the abdominal cavity almost entirely [Figure 1]. The spleen, pancreas, gallbladder, bilateral adrenal glands, and kidneys appeared normal. Provisional diagnoses based on diagnostic imaging were intraperitoneal omental cyst, myxoma, and lipoblastoma. At laparotomy through a transverse upper abdominal incision, the giant fatty mass was dissected easily from the greater omentum. The tumor was encapsulated and lobulated with a yellowish, irregular surface, measuring 21.5 × 19 × 9 cm, and weighing 1590 g [Figure 2]a, 2b, 2c. Histologically, most lesions comprised areas of low cellularity with variable myxoid change with primitive mesenchymal tumor cells in spindles or satellites, classic lipoblasts including multivacuolated lipoblasts, or adipocytes. Tumor cells manifested neither necrosis nor mitotic activity. Areas of proliferation of small round cells were absent. 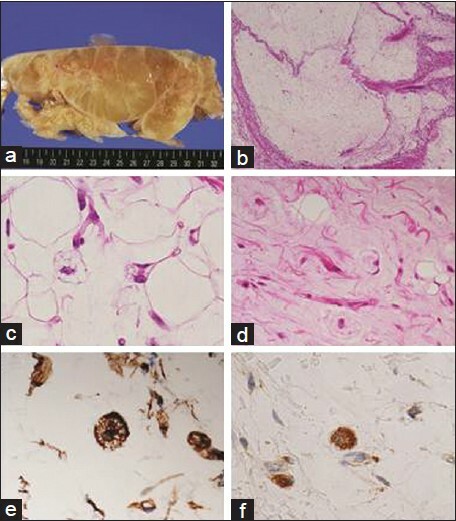 Immunohistochemically, lipoblasts or mature adipocytes were positive for S100 and mesenchymal tumor cells were positive for CD34 and CD56 [Figure 3]. Omental lipoblastoma was diagnosed based on these data. Postoperative recovery was uneventful and discharge was possible within one week of surgery. After 20 months follow-up, he is disease-free, with no signs of recurrence on routine abdominal US. Lipoblastoma is a developmental disorder of embryonal fat that might manifest at birth or appear later in childhood. Of all the soft tissue neoplasms reported in children, lipoblastoma represents only 5 to 30%; intraperitoneal lipoblastoma is extremely rare and comprises 7% of these tumors, and only 7 cases of omental lipoblastoma have been previously reported in the English literature [Table 1]. CD56, expressed in many pediatric malignant tumors including neuroblastoma, Ewing's sarcoma, rhabdomyosarcoma and Wilms' tumor, and in the bile ducts of patients with extrahepatic biliary atresia  has an established role in the diagnosis of non-Hodgkin's lymphoma-natural killer cell type and other hematologic malignancies. In our case, because primitive mesenchymal tumor cells were found to express CD34 and CD56, we can speculate that primitive mesenchymal precursor cells had undergone neoplastic change with variable differentiation to mature adipocytes - an histopathologic course more typical of lipoblastoma. There is an unchallenged general agreement that total excision is the treatment for lipoblastoma because it has a tendency to grow to large proportions and to invade locally. No spontaneous resolution or reduction in size has been reported for lipoblastoma, and recurrence rates of 14 to 25% have been reported in cases of incomplete excision. , A 12-month period without recurrence is generally regarded as curative. , Our case remains well 20 months postoperatively, with no signs of recurrence. 1. 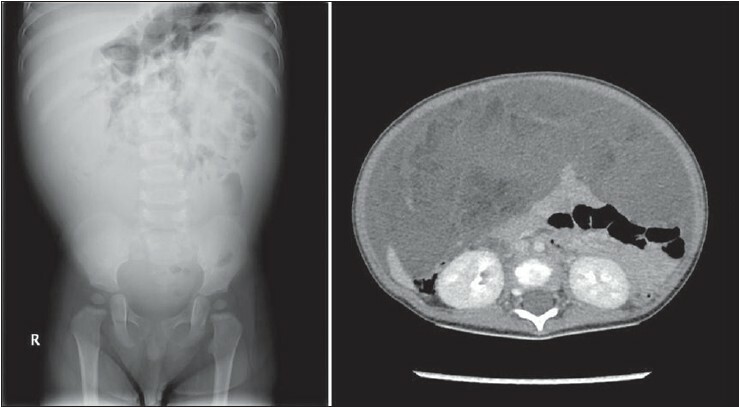 Prando A, Wallace S, Marins JL, Pereira RM, de Oliveira ER, Alvarenga M. Sonographic features of benign intraperitoneal lipomatous tumors in children-Report of 4 cases. Pediatr Radiol 1990;20:571-4. 2. Beebe MM, Smith MD. Omental lipoblastoma. J Pediatr Surg 1993;28:1626-7. 3. Trobs RB, Meier T, Nenning H. Benign mesenteric lipoblastoma. Pediatr Surg Int 1996;11:452-6. 4. Soin S, Andronikou S, Lisle R, Platt K, Lakhoo K. Omental lipoblastoma in a child: Diagnosis based on CT density measurements. J Pediatr Hematol Oncol 2006;28:57-8. 5. Mallick MS. Omental lipoblastoma. J Ayub Med Coll Abbottabad 2007;19:134-5. 6. Mendez-Gallart R, Estevez-Martinez E, Bautista-Casasnovas A, Cameselle-Teijeiro J, Varela-Cives R. Giant omental lipoblastoma in a 10-month-old infant composing 20% of total body weight. J Pediatr Surg 2007;42:1149-52. 7. Koplin SA, Twohig MH, Lund DP, Hafez GR. Omental lipoblastoma. Pathol Res Pract 2008;204:277-81. 8. Gisselsson D, Hibbard MK, Dal Cin P, Sciot R, His BL, Kozakewich HP, et al. PLAG1 alterations in lipoblastoma: Involvement in varied mesenchymal cell types and evidence for alternative oncogenic mechanisms. Am J Pathol 2001;159:955-62. 9. Gonzalez-Crussi F, deMello DE, Sotelo-Avila C. Omental-mesenteric myxoid hamartomas. Infantile lesions simulating malignant tumors. Am J Surg Pathol 1983;7:567-78. 10. Torbenson M, Wang J, Abraham S, Maitra A, Boitnott J. Bile ducts and ductules and positive for CD56 (N-CAM) in most cases of extrahepatic biliary atresia. Am J Surg Pathol 2003;27:1454-7. 11. Chung EB, Enzinger FM. Benign lipoblastomatosis. An analysis of 35 cases. Cancer 1973;32:482-92. 12. Jimenez JF. Lipoblastoma in infancy and childhood. J Surg Oncol 1986;32:238-44. 13. Stringel G, Shandling B, Mancer K, Ein SH. Lipoblastoma in infants and children. J Pediatr Surg 1982;17:277-80. 14. Mahour GH, Bryan BJ, Isaacs H Jr. Lipoblastoma and lipoblastomatosis - A report of six cases. Surgery 1988;104:577-9.